Ten years ago today, the first iPhone arrived, sporting an all-new user interface built on a multi-touch screen and a virtual keyboard that soon replaced all that had come before for mobile devices. Combined with internet access and, later, an online app store that offered enterprise applications, the iPhone allowed workers to treat their cell phone as a more convenient, portable computer. It also meant that companies had to figure out -- quickly -- how to manage all those new iPhones. Steve Palmucci remembers suddenly seeing new iPhones show up at work, and he immediately worried about its lack of security and business capabilities. Nevertheless, employees seemed to love them, and made it clear they wanted to use them for work. "Compared to the Blackberry, which at the time was the standard for secure mobile access to enterprise data, the iPhone introduced risk," said Palmucci, who at the time was senior director of IT at Sungard Availability Services. "It was also limited initially to release on AT&T as the carrier in the US." Now CIO at TiVo Corp., Palmucci recalls how quickly the iPhone became popular among co-workers. "It wasn’t driven by apps that had enterprise value at the time," he said. "...They loved the design, the interface,and the allure of the Apple brand." And he remembers the aftermath of its arrival: "When the iPhone was first released in the U.S. in 2007, there was a significant impact on enterprise IT because this was the real beginning of the consumerization of IT." Before then, workers had been doing things like bringing personal routers into the office so they could connect smartphones or tablets to the corporate network. But their numbers were comparatively small; it was the iPhone that kicked "shadow IT," where employees took technology into their own hands, into high gear. "I don't know that there was a real shadow IT movement prior to the iPhone," said Chris Silva, a Gartner research director. "The iPhone was definitely shadow IT 1.0. Everyone was taken by surprise." IT shops stayed busy trying to make sure employees weren't circumventing corporate email by forwarding messages to their personal mail accounts so they could use them on their iPhones. Before 2007, it wasn't unusual for some to bring in their own cell phone for work-related tasks or to rely on a corporate-issued Blackberry. The iPhone phenomenon up-ended years of mobile management practices, according to Phil Hochmuth, IDC's program director for enterprise mobility analysis. Along with its revolutionary touch interface, the iPhone carried with it Apple's reputation for having a more secure platform, which helped with its adoption as the No. 1 mobile device in corporate America. "It's not necessarily true that the iPhone is more secure than Android, it's just a perception in the market," Hochmuth said. With plenty of onboard storage and the ability to connect directly to their computers, the iPhone quickly won over early owners -- who soon called on IT departments to support it. "It put enterprise IT on the defense because you had everyone bringing devices with Wi-Fi and browsers and asking to connect to email," Hochmuth said. "From a mobile device management perspective, there was really no way to manage those things." In a real way, the iPhone spurred the rush to a coherent enterprise mobility management (EMM) strategy, as companies such as MobileIron and AirWatch raced to support it with their software, said Hockmuth. "For a variety of reasons, including high cost, the first generation iPhone wasn’t broadly deployed in my company initially. However, users’ demands for the technology they liked best and used it their personal lives, coupled with the explosion of applications, and the vast improvements in security, led the IPhone to where it is today, which is a critical component of the enterprise technology landscape," Palmucci said. In 2007, Adam Rykowski had just been hired by AirWatch, which at the time focused on selling software to manage wireless endpoints -- not the devices connected to them. 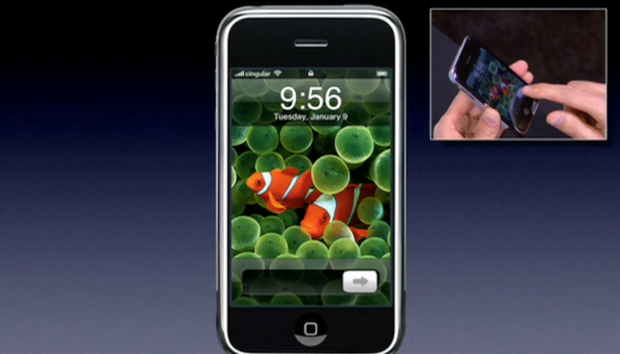 Like other users, Rykowski said he'd been instantly enamored of the iPhone and bought the first model for $600. "We talk about consumerization driving IT, that was the catalyst for it. That's when we really saw consumerization of IT revolutionize the way companies did business," said Ryknowski, now the vice president of product management at VMware AirWatch. At the time of the iPhone's launch, AirWatch found itself in the same place as many corporate IT managers: stunned by how quickly it reshaped the market. Employees, typically executives, were inundating IT departments with requests to have their business email put on their personal iPhones. Prior to that, mobile device management was reserved Blackberrys or other line-of-business "ruggedized" devices. Founded in 2003, AirWatch had undergone a number of iterations as "a wonky security-type vendor," Silva said. It wasn't a message that was resonating well with IT departments. MobileIron, founded in 2007, began touting its ability to track down cellular dead spots, which could result in dropped calls on the iPhone. It was considered part of device management because when executives hit the road, they wanted to be sure they didn't lose mobile connectivity. "The iPhone was tough to support because the throughput speeds weren't great because the networks were getting slammed," Silva said. "Signal strength was an issue up through the iPhone 4. Then, you had the whole 'Antennagate' thing where you had to hold the phone a certain way if you wanted to make a call. The iPhone had its own share of problems." Apple introduced a new hardware design in 2010 with the iPhone 4, with the device's frame acting as an antenna. If held the wrong way, the new design affected the signal strength, resulting in dropped calls. The problem became known as Antennagate. "You literally had to hold your phone a certain way in order to make a call," Silva said. That was still a few years in the future as companies, already wary of adopting a consumer device for business purposes, realized Apple's smartphone offered limited enterprise capabilities. To help counter that, Apple in 2008 released an iOS SDK that let third-party developers create apps for the smartphone. That was followed by the launch of the App Store, where IT shops could access software to remotely manage the iPhone. As Microsoft Exchange support was rolled into iOS, the platform began adding enterprise-specific features. "It became clear it wasn't going to be this painful process to manage a device that users wanted," Silva said. "I think it's fair to say that in most organizations it was iOS...that got them into MDM and EMM investments." "They started with a great platform and opened up the right enterprise readiness capabilities to [EMM] vendors like us, and then they also provided enterprises the ability to build their own in-house applications and their own private app stores," Ryknowski added. "We had to scale quickly. That helped fuel a lot of our growth." While the Android mobile platform (acquired by Google in 2005) didn't take long to follow the iPhone, early Android phone prototypes still sported a physical keyboard like the Blackberry before it. Not until 2008 did the first Android smartphone with a touch interface appear. It was from HTC Corp. But by then, Apple had taken the beachhead. And, it wasn't until the beginning of 2011, and the release of Android 3.0 (Honeycomb), that mobile device management was introduced -- and then, it was only available on tablets, Silva said. Later that year, Android 4.0 was introduced on Nexus smartphones with MDM tools. "Android support definitely lagged," Silva said. "The versions of Android around up until 2011 by all standards couldn't have been supported in the enterprise. Organizations weren't even thinking about it; they were just trying to solve the iOS problem." At the time, corporate-issued Blackberries still had a double-digit market share of the mobile enterprise and were especially popular in the halls of government in Washington, D.C. The iPhone was considered a step down from a BlackBerry because it didn't support nearly as many enterprise-specific features. But with the launch of the Apple App store, many popular apps, including email, expense forms, file sharing and cloud storage -- as well as specific healthcare and financial apps -- were all at an employee's fingertips. "I think the iPhone is a once-in-a-generation kind of product. It defined the product category and the technology..., touch screens, advanced multitouch operating systems, that sort of thing," Hockmuth said. "What really drove Apple and BYOD were the apps, because Blackberries were great devices. They were secure and had some great apps... But the iPhone App Store and subsequently the Android [Google] Play store, broadened the horizon of what a business thought of as mobile productivity." The iPhone became so popular, Silva argued, because its features, functions and apps were aimed at the end-user, not at a line of business. Addressing business issues simply wasn't Apple's focus. For years, even Apple's brick-and-mortar retail chains lacked staff who could demonstrate hardware applicability in the workplace for users, Silva noted. While the iPhone's enterprise functionality became more formalized as device management features -- app provisioning and user permissions limits -- became codified in iOS 6, Apple did not rush to add enterprise features, Silva said. "Enterprise has long been Apple's, 'OK, we'll solve that when we get to it,'" Silva said. "Everything from the licensing of apps to the ability to do MDM..., they got there, but it wasn't a core focus." While it may have taken years, the iPhone has now essentially become the new Blackberry, Hochmuth argued. Today, Apple's iOS claims 48% of all corporate-issued smartphones or phablets, compared to 37% for Android and 11% for Windows Moble OS, according to Gartner. And it claims 59% of tablets, largely because of the wildly popular iPad. But the competition is closing in quickly. While Android may have been a late arrival, it's more focused on enterprise applications than at any time in the past. "I could see Android gaining share in terms of corporate-liable tech devises," Hochmuth said. "Android [hardware manufacturers] and Google are focusing more on the enterprise than ever before. Even Apple just started recently looking at the enterprise as a target market. "They've always been in the enterprise, but that was not by any intent of Apple." Google, of late, has made workplace encroachment a top priority. "Google is focusing more on the enterprise now. They're starting to expand security capabilities. They're starting to have more [manufacturing] partnerships around B2B," Hochmuth said. "I could see Android becoming more predominant in businesses over time as they change the image of the OS." As Hochmuth noted, it's not as if Apple hasn't been making "a ton of money" with its approach to businesses in recent years. But as the rate of iPhone adoption slows, which it has, Apple should look to the enterprise as a place to grow. That doesn't mean more iPhones in the enterprise, but it does mean more enterprise-focused software on existing devices. Apple has already teamed up with a variety of enterprise application vendors, including SAP, IBM and Cisco. More than two years ago, Apple partnered with IBM to create the MobileFirst for iOS initiative, which resulted in more than 100 industry-specific enterprise applications designed from the ground up for the iPhone and iPad. In 2015, Apple partnered with Cisco to help optimize networks for iOS devices and apps, including integrating the iPhone for use with Cisco enterprise environments. Last year, Apple partnered with SAP to deliver a new iOS SDK and training academy for developers, partners and customers. The goal: to make it easier to build native iOS apps tailored for business needs. And just this week, Apple CEO Tim Cook talked up the company's enterprise efforts at Cisco Live. While it may be partnering with more enterprise-level vendors to bring specific business uses to its devices, iOS still lacks key features, analysts said. For example, it lacks multi-user device support and granular app-level controls. If, for example, a user wants to have Microsoft Word on their iPhone or iPad, it's automatically tied to a work profile and there's no other way to use it except as a work application. Google, however, created Android for Work -- APIs that allow users to create one profile for work apps and another for personal use. For example, a user can split their Gmail account into a personal version and work version on the same device. "iOS still has a bit of a ham-handed way in dealing with application management in giving you a work and personal version of an app," Silva said. "Android lets you have multiple users associated with a single device, where iOS has been roundly criticized for not doing that on iPhones and iPads, except for education." Even in the recent unveiling of iOS 11, there was no mention of multi-user support. Regardless of any current shortcomings, the iPhone far and away still enjoys the majority share within enterprises because it is considered the most stable and consistent of the mobile platforms, and it has key, built-in features businesses appreciate. "From a security standpoint, iOS tends to have a better security posture than the generic consumer Android device, and that's going to keep it in the enterprise," Silva said. "And, if I have an iPhone 5 sitting on my desk, I can pull that thing out and install the latest version of iOS on it and still manage it the same way I manage an iPhone 7."